STILL THINKING WHY GET THIS PRACTICE SUTURE KIT? 100% Money Back Guaranteed if you do not like it(I highly doubt it) return it. 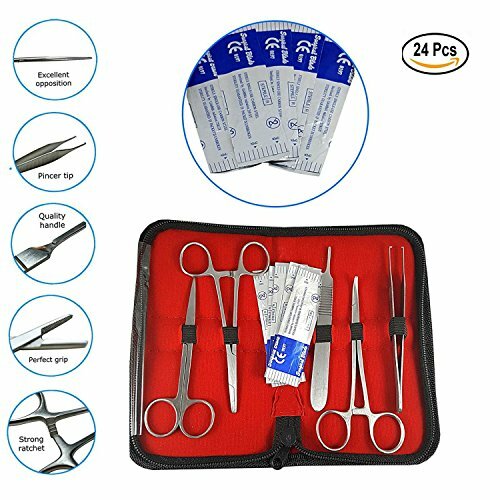 1 x Needle Driver 5""
1 x Mosquito Forceps 5""
1 x Iris Scissors 4.5""
1 x Adson Toothed Forceps 5""
⚕️ STERILE SUTURE KIT : Discover a complete training suture kit that is ready to use [sterilized] with a variety of materials like Nylon, Polypropylene,Polyester and Silk Sutures in different sizes that is perfect to train. ⚕️ LONGER EXPIRATION DATES : Individually packaged with long expiration dates than a lot of our competitors in the market. Disclaimer : Make sure they are stored per instructions for longevity. ⚕️ PERFECT LACERATION KIT [TRAINING PURPOSE ONLY] Be it Lab Experiments, Practicing for School, Veterinary Practice, Anatomy and Biology Classes, EMT Paramedics, Nurses, and Dental Practice Students this kit has it all at the most affordable prices. ⚕️ ISO & CE STANDARDS : Passed International Organization for Standardization (ISO) and CE 1023 that is primarily designed for training and instructional applications only. ⚕️ MONEY BACK GUARANTEE : We stand behind our Suture Practice Kit at "Rad Mile" and offer a 30 day no questions asked 100% money back guarantee on all our products. Avoid potentially dangerous fakes and cheap imitation knockoffs of our product by purchasing only from our authorized seller 'Rad Mile'. Other sellers may not be as concerned about your safety as we are. View More In Scientific Gifts. If you have any questions about this product by Rad Mile, contact us by completing and submitting the form below. If you are looking for a specif part number, please include it with your message.